Back by popular demand the Drug Name Emoji Game round two has arrived! In this version try to identify the antihypertensive emojis that make up a medication name. 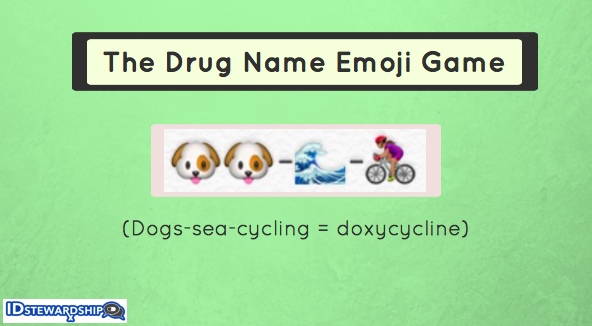 What better way to learn about drug names than from an emoji puzzle? The original Emoji Name Drug Game was published in January 2017. Between that time and May 2017 people have shown a lot of love for this fun way to learn drug names, with many thousands of visitors to the webpage. Since there was a positive response, as promised, here is round 2! This round focuses on blood pressure drugs, providing antihypertensive emoji combinations for you to solve. Each line presented below is a group of emojis that corresponds to a drug name or drug class name. Find the right meaning for the symbols and put it all together to determine the answer! Note that both brand name and generic names are used here. If you like this puzzle share it with your friends. If you have ideas for additions, just tag @IDstewardship on Instagram! Have an idea that is not shown above? Share it and tag @IDstewardship on Twitter or Instagram!